INDIANAPOLIS, Monday, Jan. 15, 2018 - Dan Gurney, one of America's true auto racing heroes, passed away Sunday, Jan. 14 in Southern California following complications with pneumonia. He was 86. A tall, handsome, larger-than-life American who raced in Europe during the late 1950s and 1960s at a time when the American public was generally not following European racing anywhere close to the extent it later would, Gurney enjoyed considerable success overseas, including winning four Formula One World Championship Grand Prix events and sharing the winning car in the 1967 Le Mans 24 Hours with A.J. Foyt, plus the 1960 Nurburgring 1000-kilometers with Stirling Moss. But he also won at home, claiming seven United States Auto Club-sanctioned National Championship events in the late 1960s; five out of the six grueling 500-mile NASCAR stock races held over the Riverside, California, road course between 1963 and 1968; numerous events in the SCCA Can-Am and Trans-Am series; and even the first professional road racing series ever conducted in the United States, the inaugural USAC Road Racing championship in 1958. Gurney drove in nine consecutive Indianapolis 500-Mile Races between 1962 and 1970 - finishing second, second and third in the final three - and was the winning manufacturer three times. Bobby Unser drove Eagle chassis constructed by his All-American Racers company in Santa Ana, California, to victory twice (for Leader Cards, Inc., in 1968 and for Gurney's team in 1975), and Gordon Johncock won in an Eagle for the Patrick Racing Team in 1973. Of all of Gurney's numerous accomplishments, undoubtedly the most renowned took place during an incredible eight-day period in 1967. On the weekend of June 10 and 11, he shared the winning Ford GT40 Mk IV with Foyt in the 24 Hours of Le Mans. On the very next Sunday, Gurney won the Belgian Grand Prix over the blindingly fast Spa-Francorchamps circuit, driving a Gurney Weslake-powered All-American Racers Eagle for which he was manufacturer and team principal. This remains the only occasion when an American driver won a points-paying Formula One World Championship Grand Prix at the wheel of an American car. Jimmy Murphy's victory with a Duesenberg in the 1921 French Grand Prix took place almost 30 years before there was a World Championship for drivers. After finishing second in the German Grand Prix, third at Portugal and fourth in the Italian Grand Prix for Ferrari in 1959 in front-engine cars, Gurney moved to BRM for a season and then to Porsche where he won the 1962 French Grand Prix at Rouen. He also won both the French Grand Prix and Mexican Grand Prix for Jack Brabham's team in 1964. By this time, Gurney already unintentionally had played a major role in changing the face of racing at the Indianapolis Motor Speedway. Despite being an enthusiastic spectator at East Coast midget car racing events during his teen years, Gurney had never visited IMS before he went there as an entered driver in 1962. He was scheduled to drive a rear-engine turbine for John Zink but ultimately qualified a rear-engine Buick-powered car for Mickey Thompson after taking his "rookie" test, incidentally, in one of Zink's Offenhauser-powered front-engine "roadsters," a historical footnote about which Gurney was extremely proud. Driving in the "500" while also competing on the Grand Prix circuit in those days required quite a bit of trans-Atlantic travel during May. 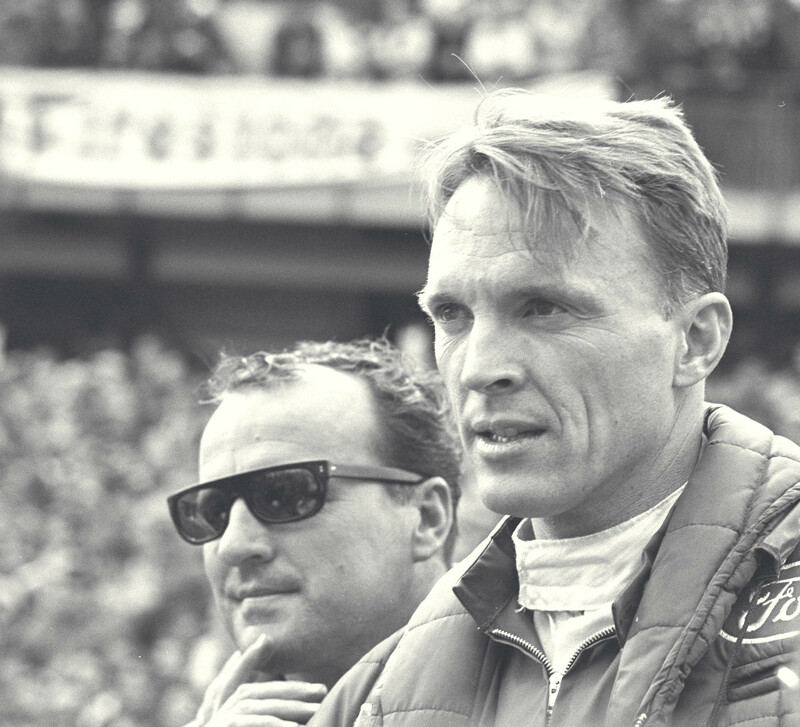 After qualifying for the 1962 "500," but well before the race itself, Gurney flew to Zandvoort for the Dutch Grand Prix on May 20. He had plenty to think about on the flight. Although rear-engine cars had been entered for the "500" between 1937 and 1951, they had enjoyed virtually no success. But after then two-time defending World Champion Brabham came to Indy the year before, 1961, and drove an underpowered rear-engine Grand Prix Cooper-Climax to ninth, Gurney became yet another person who began to contemplate the potential of the lightweight rear-engine cars that were dominating Grand Prix racing. After arriving in Holland, Gurney began trying to convince Colin Chapman of Lotus that he should go to Indianapolis and at least have a look. Chapman rather reluctantly agreed, but only after Gurney offered to pay his passage. Once at the Speedway, Chapman also began to see the potential, and his enthusiasm increased when Gurney confided in him that Ford Motor Company - after an absence of several decades - was considering an Indianapolis 500 entry and sought a team with which to partner. A marriage was soon made, and a team of three production-based V8 Ford-powered Lotus cars were entered in the 1963 Indianapolis 500 to be driven by Chapman's top driver, Jim Clark, and by Gurney, who, in those days of much more sporting interchange and driver freedom, was on loan from Brabham. Clark went on to finish second in the "500." Gurney, down on power and making a second stop while Clark only made one, salvaged seventh. Racing at IMS was about to change forever, and days of the front-engine cars were all but over. Technology began to increase by leaps and bounds, and Gurney was right there and heavily involved with much of it, including what was probably the greatest quantum leap in the history of the track from a technological advancement standpoint. Rear wings were not permitted until 1972, the rule up though 1971 being that "any aerodynamic device had to be an integral part of the body." But after Team McLaren found a way around that rule in 1971 and snuck a wing into its so-called engine cover, the barn door was about to burst wide open. The official one-lap qualifying record going into qualifying in 1971 was 171.953 mph by Joe Leonard, in 1968. By the time qualifying was over in May 1971, Peter Revson had raised it, with one of the new McLarens, to 179.354 mph. For 1972, "bolt-on" rear wings were now permitted. By the time qualifying was over this time, Bobby Unser, driving a Roman Slobodynskj-designed 1972 Dan Gurney Eagle, had turned a single lap at an unbelievable 196.678 mph. There are so many wonderful stories involving Gurney, who incidentally, on race morning 1968, wore the first full-face helmet ever seen at the Speedway. He had many endearing personal traits, such as his boyish grin and an impish sense of humor. And perhaps the most endearing of all: Even into the later years, whenever he was paid a compliment, especially by a member of the distaff side, he would break into that wonderful grin and then he would blush. He was very much an unabashed "stand-on-the-gas" type as a driver, who dropped out of many races while in commanding positions. But Gurney once confided that some of his favorite races had been ones he hadn't finished, chuckling that he would far rather blow up while leading a race than be restricted to a strategic and disciplined pace to try and win. He could also be what the Brits used to refer to as "a bit of lad." There was the time, while he was chauffeuring a rental car, that the subject of the intricate moonshiner's "180-on-a-bridge" escape maneuver came up in conversation, and one of Gurney's passengers explained how it was achieved. The word is that, with another huge grin on his face, the "All-American Boy," in complete deference to his public image, tried it himself several times until he had it perfected. But there were the serious times, as well. Perhaps the most poignant Gurney anecdote of all of them took place at the funeral of Clark in April 1968. Gurney attended the service, along with virtually the entire Grand Prix brigade, but with the angular Gurney standing head and shoulders above his colleagues. At one point, a gentleman came over and asked Gurney if he could spend a few private moments with him away from the others. The gentleman identified himself as Clark's father. He went on to explain that the family had seen very little of Jimmy in recent months, after the crippling British tax laws had forced him into following in the footsteps of so many others in the sports world and in show business by moving to the continent, and typically to the south of France. "But when we did spend time with him," Mr. Clark continued, "and Jimmy started discussing the other drivers with us, I wanted you to know that he told us on more than one occasion that the one he said he "feared" the most as a competitor was you." The report is that Gurney began to weep, and indeed, decades later, tears would typically come to his eyes whenever this was mentioned. There could have been no greater compliment. Gurney is survived by his wife, Evi, and four children. Services will be private, per Gurney's wishes. In lieu of flowers, donations can be made to the Hoag Hospital Foundation in Newport Beach, California. Condolences and sentiments can be sent to [email protected]. NOTE: Changes made to your profile information only apply to future marketing messages. If you require changes that are specific to your ticket account with the Indianapolis Motor Speedway, you must call the IMS Ticket Office at (317) 492-6700.